One of the challenges of historical archaeology is superimposing various types of knowledge onto the present landscape. This spring I learned how to combine modern satellite images, antique aerial photographs, and old land title maps, with information from historic documents as I hunted for the Stonecutters’ Labour Hall and its mysterious cornerstone, last glimpsed in 1973. 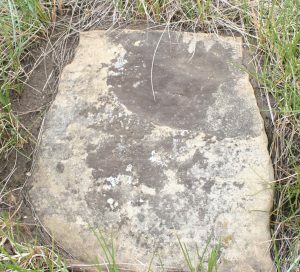 When members of the Archaeological Society of Alberta – Calgary Centre (ASA-CC) began the Glenbow Town and Quarry Project in 2009, we gathered all the previous research done at the site. This included photos taken by the students of the nascent University of Calgary Archaeology Department during a survey of the area in 1973. The most haunting was a picture of a sandstone block roughly inscribed, “LAID BY / J. 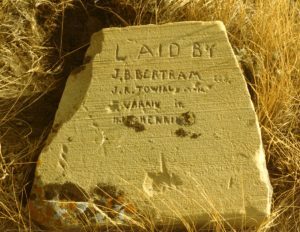 B. BERTRAM / J. R. TOWILL…” There were clearly two more names listed, but lichen obscured the letters. The photo was labelled simply cornerstone. No location was recorded. I became convinced it depicted the cornerstone of the Stonecutters’ Labour Hall, the only public building in Glenbow village. Although the building’s primary function was as a union hall for the stonecutters who worked at the Glenbow Quarry, it was a centre for other community activities as well. Historic documents indicated it had served as a temporary schoolroom, while the settlement awaited construction of its official schoolhouse. Local histories told of its additional use as an occasional dancehall. This structure seemed worthy of an engraved cornerstone. Now the only question was, where was it? We had walked through the village numerous times and mapped many building remains, albeit only cellars or outlining ditches. In all our years of exploring, however, we had not seen the missing cornerstone. Finding it among the tall, swaying grasses seemed a lost cause. Then, I happened upon a fascinating online resource; The Stonecutters’ Journal, the union magazine of the journeymen stonecutters had been scanned and was freely available. It recorded many details of the organization and the local branches that composed it, including Glenbow. While reading through the union correspondence published in the journal, the name of a Glenbow resident caught my eye. He was forwarding a trustee deed for the union’s Glenbow branch property and noted that two men, one of of whom he named, were trustees. I immediately looked through the land title documents I had compiled years earlier and found a title with the names of two men, one of them the man identified in the letter. I compared the dates of the letter and the land title: the letter was dated 12 December 1911; the title was marked 13 December 1911. Now I knew the village lot where the Labour Hall had been built. The next step was to figure out where that lot was on the present-day landscape. I had an idea where it should be, but wanted to confidently find it on the ground. I decided to review the aerial photos of Glenbow village. The 1926 images were available online, but, I also needed the earliest photos, which were taken in 1922. Fortunately, a former member of the ASA-CC Executive Board was a map librarian and graciously scanned them for me. Surprisingly, these first images were sharper and showed more detail. By 1922, Glenbow Quarry had been closed for a decade and the village was in decline; only a few families, who had been able to find work at ranches, farms, or the CPR, still remained. I studied the black and white photographs looking for subtle variations in shade that might indicate elevation or vegetation changes. The 1922 photo did have a suspicious mark that might be what I was looking for. I needed additional data. I knew there were satellite images available from Google Earth. I opened the application in my computer’s browser and zoomed in on Glenbow. Then I went through all of the satellite photographs, using the timeline slider. The earliest ones were too blurry and indistinct. Some images were taken at night or were shadowed by cloud cover and were too dark. Others were taken in winter and were obscured by snow. Finally, I found a clear summer image. There seemed to be a change in the colour of the vegetation in the same region as the aerial photo, but to confirm it, I needed to see all the photos and maps aligned and superimposed at the same scale. Fortunately, Google Earth allowed me to import layers onto my selected area of the planet, move them around, and change their size. I used landmarks, like the CPR line and houses and their cellar pits, to match up the layers. Google Earth even took the surveyed land title map and made this flat plan view conform to the undulating topography. It took some time, but I did get the puzzle pieces fit together. I was able to alter the transparency of each layer, in order to perfect the match. The bonus was that I could show several specific structures had disappeared from the village between 1922 and 1926. Importantly, the mysterious outline of vegetation on the 1922 aerial was within the land title lot outline. Amazing! There was a definite feature in the correct lot. On a bright spring morning a few days later, we drove out to the site. Printouts in hand, I was able to orient myself, walk across the crocus-dotted grassland, and point out where the feature should be. The vegetation was unusually short, since it was early spring and the park had started grazing cattle there the previous fall. My long-legged Co-Director walked right to the edge of the rectangular depression, highlighted by the low angle of the sun, stopped at the corner, looked down, and gave me a big smile. I went running over and saw a chunk of sandstone at my feet. It was the exact shape as that in the 1972 photo — Yes! I let out a whoop and when I stopped jumping up and down, I bent to examine it. It was smaller than I had imagined, but where were the words? I brushed my hand across the lichen-covered surface. The rock was damaged by a large chip. Hmmm — we debated whether the stone was eroded, or perhaps upside down, and continued our survey. That afternoon, we returned to the union hall for a final look at the cornerstone. The shifting sun had rendered the foundation depression nearly invisible, if you did not know where to look. When we reached the cornerstone, some faint indentations were shadowed by the low-angled light: “L…/ J B…” I grinned. It was definitely our cornerstone. Then my heart gave a little wrench — time had not been kind to the inscription. Would I ever be able to read those last two names? Perhaps with conservation and proper cleaning? Maybe there was a new technology that could help? After recording the stone in place with laser scans and photographs, we excavated it this fall; we were fortunate to also find one of the chips with lettering still visible. The stone will be sent, with all the other artifacts we have recovered, to the Royal Alberta Museum, where they will be preserved for future study. If it had not been for the modern Google Earth application, the path I followed to find the missing cornerstone would have been onerous, if not impossible. While some of the materials I pulled together were available years ago, they were not easily accessible and the ability to manipulate them was only possible with a lot more time and money. Heck, the satellite images I used had not even been taken when we began our research eight years ago. Clearly the time was right for this discovery to be made. Perhaps good things do come to those who wait. This article was originally printed in the BERGEN NEWS and is being reprinted with permission.